December is the most beautiful time to visit Vietnam with milder climate and pleasant in every region of the country. You will experience sunny days with a touch of wind in attractive beaches and spectacular sites in the South and the Center. The North may cooler than the South and the South with low temperature. Moc Chau plateau, located about 200 km west of Hanoi, is one of Vietnam’s most attractive places in December. Despite the cold winter, Moc Chau Plateau maintains its stunning beauty with a wide variety of flowers and down in the valleys. Yellow wild sunflowers and white mustard flowers lend color to the landscape around Moc Chau. In the weeks before Tet holiday, there are vast forests of blossoming plum trees, especially around Kia Cave, Paco, and Tan Lap, where the white plum flowers are so numerous that they are like snow blanketing the valleys. 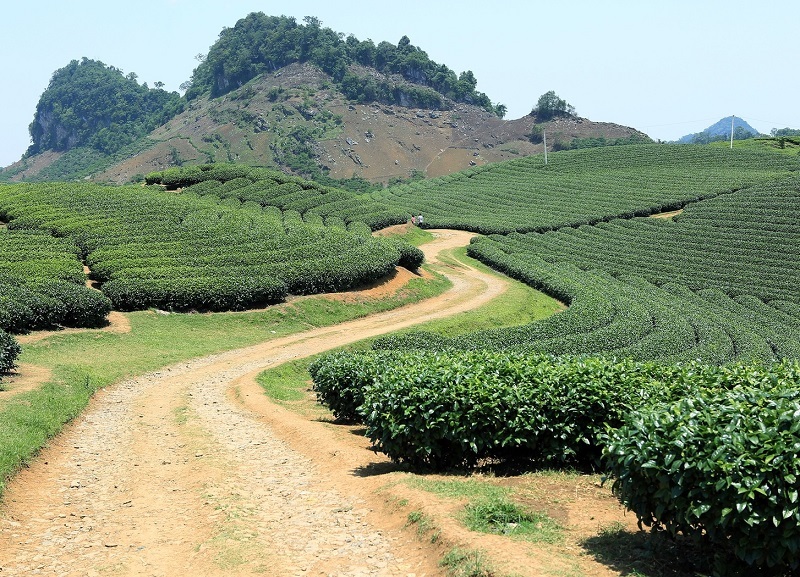 In Moc Chau, you can visit tea farms and learn how to pick tea leaves, dry them and then brew a cup. You can also sample local specialties like fried beef, fish and fresh milk. Thanks to such attractions, Moc Chau is the number one choice of travelers at this time of the year. December is the best time for trekking to conquer Pha Luong peak to chase the clouds and take stunning pictures. Halong Bay is one of the world’s natural wonders, and is always a highlights for Vietnam destinations in December. Halong Bay features more than one thousand awesome limestone karsts and islands of various sizes and shapes along the coastline of Bai Chay Beach. 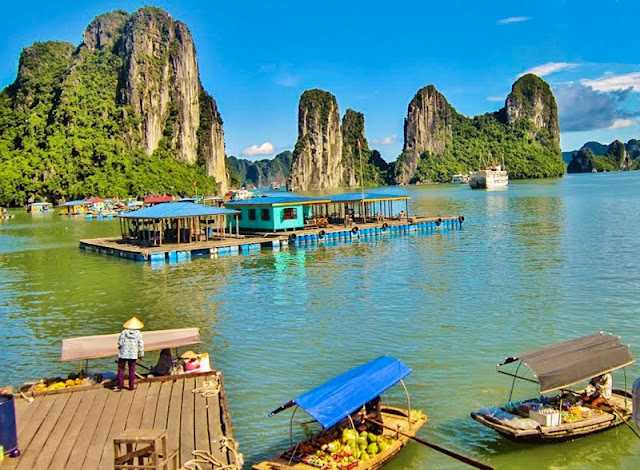 The best way to tour, see and enjoy Halong Bay scenery is board a junk boat and cruise around the bay’s islands (if your time is allow we recommend you to take the overnight trip and enjoy your silent night there). A Halong bay cruise in December is an ideal way to spend the holidays with your family or friends. Halong bay cruise ships are fully decorated with lights, and holiday-themed music fills the air. Many cruise lines offer special holiday rates for the month of December. The best cruises travel to a variety of warm-weather destinations, including the Halong Bay, Bai Tu Long Bay, Lan Ha Bay, Cat Ba Island. Another great activity in Halong bay in December is kayaking around the islands. Kayaking in Halong Bay is the best way to explore the breathtaking beauty of Halong Bay. Paddle through islets; visit hidden caves, lagoons, unspoiled beaches and floating fishing villages. The Huong Pagoda, also known as Perfume Pagoda, is a vast complex of Buddhist temples and shrines built into the limestone Huong Tich caves. It is the site of a religious festival which draws large numbers of pilgrims from across Vietnam. For those who have visited Perfume pagoda once remember the interesting feeling of boating through a small stream on the way to the pagoda. It is a romantic Yen stream of 4 kilometers long winds around mountains. During winter, Yen Stream becomes more peaceful. There are no busy lines of boats or laughter and chatter heard in festival seasons. Sometimes, a few off-season tourists come and enjoy themselves among the simple lives of the locals. Especially, if you come here in November & December, you will see the water lilies in bloom. Water lily bloom at the end of year; hence it is not a festival season. That’s why it is very quiet and suitable for those who want to contemplate in a peaceful space. Nowadays, Yen stream has become a favorite attraction in suburban Hanoi. There is nothing exciting like boating with friends, contemplating and taking nice photos. 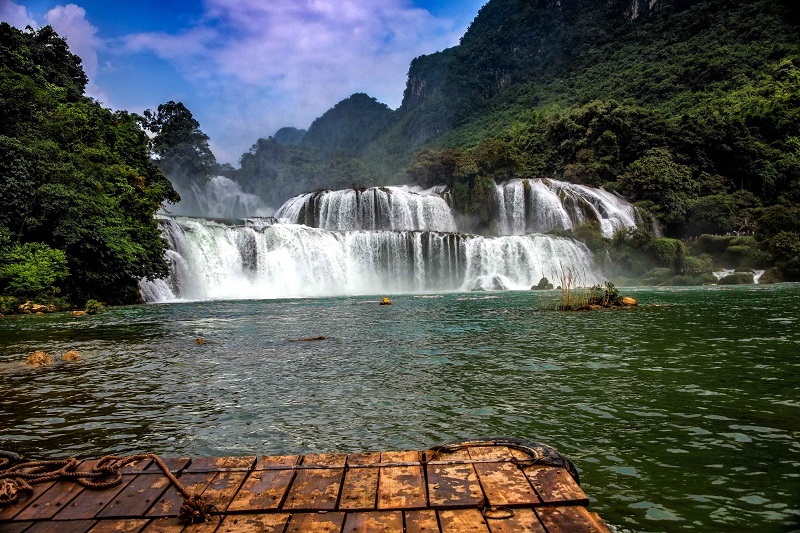 To most travelers visiting the north-western border provinces, Ban Gioc Waterfall is a “must see” tourist site. The waterfall is in Đầm Thủy Commune, Trùng Khánh District, Cao Bằng Province, on the border with China’s Guangxi Province. Ban Gioc waterfall is the fourth largest border waterfall after Iguazu between Brazil and Argentina, Victoria between Zambia and Zimbabwe, and Niagara between Canada and the US. It is one of the 10 most spectacular waterfalls in the world, according to Touropia travel site. December comes signing the blooming season of wild sunflowers and buckwheat flowers stretching along the sides. Ban Gioc waterfalls are difficult to reach, however worth the trip because of its absolutely stunning scenery. To be assured, just book the private tour to this place. Mui Ne is relatively different to the other places in Vietnam. 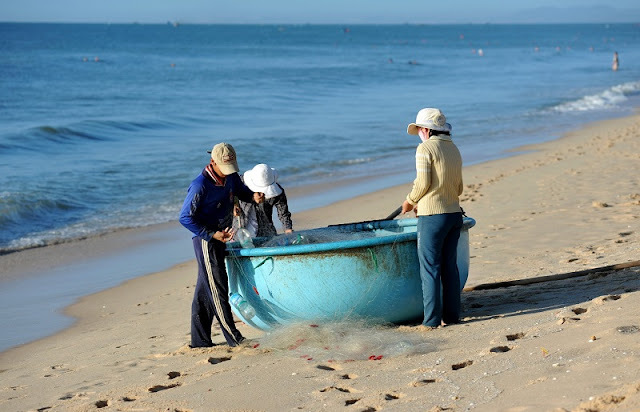 The weather in Mui Ne is dry all year since Binh Thuan province – where Mui Ne resides – is the driest region in South East Asia; and even in the rainy season, there seems to be very little rain in comparison to nearby places, like Nha Trang, Hoi An. It will be an omission if we don’t consider Mui Ne as one of the most stunning beaches in Viet Nam. Mui Ne is located in Phan Thiet – the capital of Binh Thuan Province. It is a beautiful beach with many high-ranked coastal resorts, which can easily satisfy any traveler. Mui Ne attracts not only international but also domestic traveler with its gorgeous beach and many interesting activities. Besides that, Mui Ne is also famous for kite and windsurfing. If you want to enjoy the most beautiful beaches in Vietnam, you should visit Mui Ne from December to April. In these months, the beach of Mui Ne is just amazing with yellow sand, blue water and clear sky. Tourists will have a great time lying on the beach under the palm trees; that will definitely be a memorable experience. Ho Chi Minh City (Saigon) is the busiest city in the South of Vietnam. 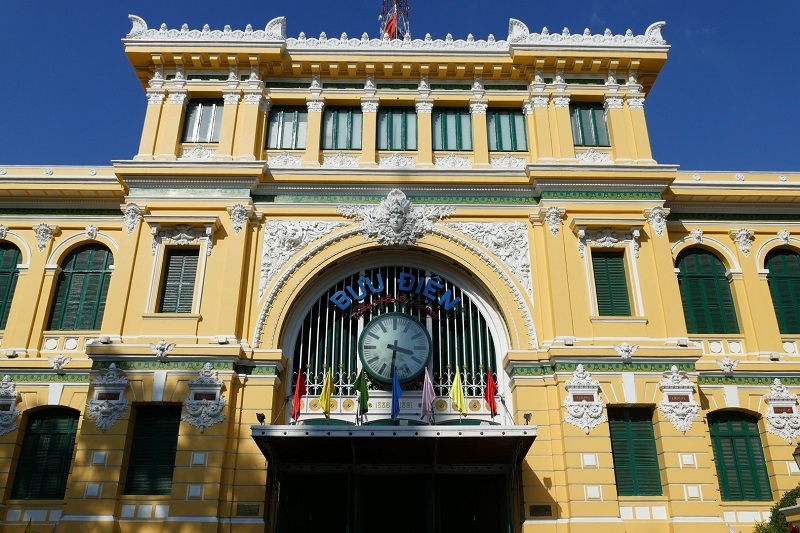 Saigon – Ho Chi Minh City is also a major tourist center, with many historical sites, beautiful spots and museums. This area has also marked the war against the French and Americans in 19th century in Vietnam. There are 11 must-visit museums in this area, including War Remnants Museum – the most famous war exhibition in Vietnam. Along with that, you should not miss many attractive sites in the 1st crowded people of Vietnam: City Hall of Ho Chi Minh People’s Committee, Opera House, Central Post Office, Nha Rong Port, Ben Thanh Market and the Independence Palace. Recently, new projects such as Diamond Plaza, Bitexco Financial Tower, Saigon Trade Center are changing the trend as well as modern lifestyle of Saigon-Ho Chi Minh city. On the city outskirts, there are also prominent attractive sites with the famous destination is the Cu Chi Tunnels. 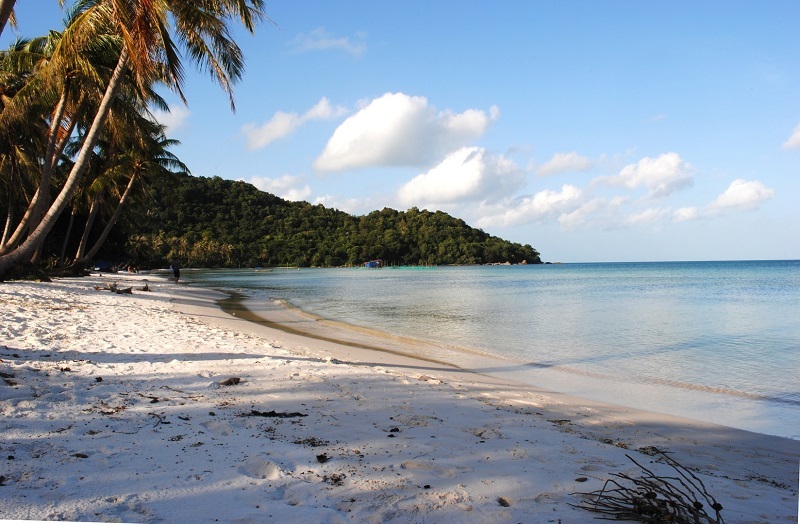 Phu Quoc Island is known for white-sand beaches and resorts, most of which are along the palm-lined coast. Phu Quoc Island now become a must-visit beach in Vietnam. Beyond the resorts lining Long Beach and the development beginning on the east coast, there is still many things for exploration and escaping: dive the reefs, kayak in the bays, dine on fresh seafood, discover the National Park, explore night markets selling crafts, produce fishsource. Unlike the weather in North which is having the cold weather of winter, in December, the weather in Phu Quoc Island is very nice and pleasant, sunny skies, lower humidity make it a great time to be here. If you are looking for the best beaches to visit Vietnam in December, then Phu Quoc Island is a wonderful choice. December also marks the beginning of the dry season in the south, the rainfall on the island is very low, only three days in a month with light rain. The perfect weather is suitable for any activities on the island. Let’s imagine that you are lying in a hammock, looking out over a glassy Gulf of Thailand glowing amber from the setting sun, consider yourself lucky to be in the know about one of Vietnam’s best-kept secrets. Sadly, developers have taken notice of the island’s potential and change is afoot and Phu Quoc is being primed for mass tourism - get here quick!